Open and bookmark this link on your work computer and even your smartphone for an easy to check database of claims hotline numbers & several email address for dozens of carriers in one helpful place. Each year, more U.S. properties within floodplains are destroyed by flooding than fire. Changing weather patterns, increased urban development, and the leveling of forests have reduced the land's natural ability to absorb water. As flooding becomes a common occurrence, property owners need to face the facts. Flood damage can happen anytime, no matter where you live. Property owners know that a homeowner’s policy covers fire damage, but most don't realize that it won't cover flood or mudslide damage. Rising waters and debris can destroy your home, business, and personal belongings within minutes. Most floods don't qualify for federal disaster aid. Only floods that are declared national disasters by the president qualify for federal assistance. This assistance is in the form of a grant averaging less than $2,500 or a federal loan that must be paid back with interest. That's in addition to payments on your existing mortgage loan! Only flood insurance protects your home and your belongings from damage caused by rising water or mudflow. Flood insurance is available for the value of the structure, minus the land value. (Contents coverage is also available, but is optional and must be requested.) Even if you have had previous flooding, you can still buy flood insurance. If you’ve received disaster assistance before, you must first obtain flood insurance to be eligible for future federal relief. As more flooding occurs throughout the country, the cost of rebuilding is skyrocketing. Floods now cause more than $2 billion in property damage each year! "For the nation's insurance companies, the Aug. 29, 2005 landfall of Hurricane Katrina, and subsequent flooding that caused thousands to flee their homes, is shaping up to be the costliest domestic natural disaster in U.S. history. Robert Hartwig, chief economist at the Insurance Information Institute, said Hurricane Katrina could force the largest payout of federal flood insurance in history -- in the ballpark of $3 billion, according to a CNN/Money report. But some consumer groups argue insurance companies should not deny policyholders money on the basis that they don't handle flood insurance. "The fact that survivors may have to go to court to fight for their rights at a time like this is shameful," Douglas Heller, executive director of the California-based nonprofit Foundation for Taxpayer and Consumer Rights, said. Flood insurance is relatively inexpensive -- the average premium is about $400 -- but voluntary, so people don't often purchase it even though it's the largest single cause of damage to homes, said Stewart of the Insurance Information Institute. Insurance agents receive little commission for it and homeowners who live outside flood-prone areas feel little motivation to purchase it. However, Stewart said he hopes one good thing that will come of Hurricane Katrina will be a new motivation for people to buy flood insurance." 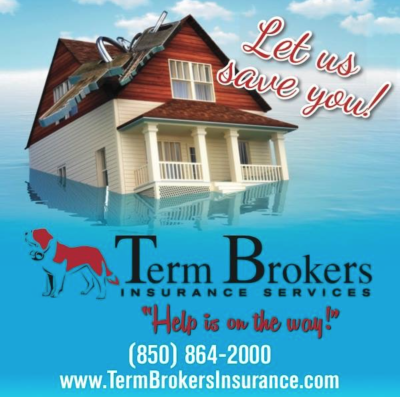 At Term Brokers, we represent the largest flood insurers in the country. Fidelity National Indemnity Insurance and Travelers Insurance are among the largest and most trusted. Term Brokers, through association with these companies is a participant in the federal government's National Flood Insurance Program. We are fully qualified to help you find adequate and affordable coverage. 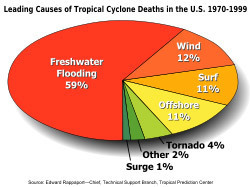 - Most importantly, contact Term Brokers to add FEMA flood insurance to your current policy. - Determine whether you live in a flood-prone area. - If flooding is possible, move valuable items from the basements or first floor to higher floors in your home. Have a checklist of these items in your emergency action plan. - Keep abreast of road conditions through the news media. - Move to a safe area before access is cut off by flood water. - If advised to evacuate, do so immediately. - Do not attempt to drive through a flooded roadway. If the roadway is flooded, turn around. Coverage for flood or rising water is a separate form of insurance obtained from FEMA through the National Flood Insurance Program and is provided and managed for you by Term Brokers. To make it clear, your homeowners' policy will not cover flood damage. Standard homeowners insurance does not cover flooding, it's important to have insurance protection from the floods associated with hurricanes, tropical storms, surges, heavy rains, and other conditions that impact the Florida Panhandle. Florida flood water damage is by far the most devastating aftermath of these storms. Covers damage to your dwelling and items such as the furnace and water heater. Covers your furniture, rugs, appliances, and clothing (subject to limitations in basement areas). Pays for sandbagging and other expenses for preventing flood damage. Covers the costs of cleaning your home and removing debris after a flood. Term Brokers has a highly trained professional staff who are knowledgeable about flood losses and able to provide you with superior claim service. Florida flood insurance is very affordable, and we offer multiple deductible options that will save you money and give you excellent care-free protection. 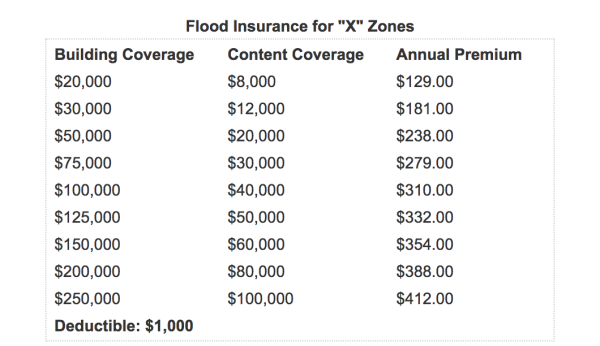 The chart below provides the annual premium for flood insurance with a $500 deductible on a home located in X zones that are not CBRA zones. The first number is the amount of Dwelling coverage and the second number is for your Personal Property. Call us today to find out if you qualify for these affordable rates! If you are not in an X Zone we still offer fast quotes when an Elevation Certificate is available. If you do not have an Elevation Certificate or do not know your zone, contact us at 850-864-2000 or jana@termbrokersinsurance.com .